This article outlines the procedures for importing and exporting session data into and out of Session Buddy and provides details about the various formats that can be imported and exported. 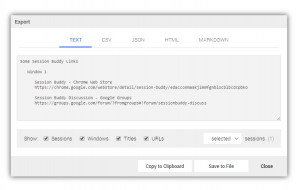 While importing a simple list of URLs is a common scenario, Session Buddy can also recognize additional types of data in import text such as sessions, windows, and tab titles. Type or paste text (eg, a list of URLs) into the text box. 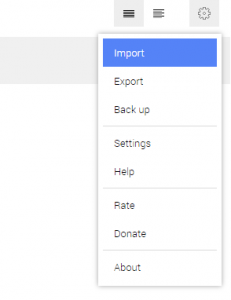 Click Select file, then select a file containing the text you want to import. Drag and drop a text file into the text box. Newline-separated list of session names, window names, and tabs, where session name and window name line items are optional. Indentation is used to denote the level (ie, session, window, or tab) of the hierarchy. Eg, if a window name is indented once, the tabs in that window are indented twice. A tab can be represented as either a URL or a title/URL pair. All tabs in the import text must be consistently of either the first or the second form. A newline separates the title from the URL in a tab pair. Tab pairs are separated from each other with at least one blank line. Indents may be any combination of space and tab characters, but must be consistent throughout the import text. Fields must be double-quoted and comma-delimited. Fields recognized: session name, window name, tab title, tab URL. Session name, window name, and tab title are optional. URL is required. Top-level object must have a single array property with a name of either “sessions”, “windows”, or “tabs”. The sample links below outline which properties of a session, window, or tab are recognized. All properties are optional except for “url” on a tab object. Session Buddy allows for the export of one or more selected sessions. 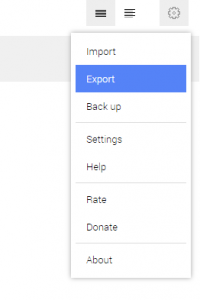 To export selected sessions, click Export in the application menu to bring up the Export dialog. In the Export dialog, select the tab for the desired output format. Check/uncheck the appropriate checkboxes to include or exclude session and window-level data as well as tab titles and URLs. Copy to Clipboard: copies the export text to your system clipboard. Save to File: saves a file containing the export text to your browser’s downloads folder. Simple Text: Ideal for including a set of links in an email message or document. CSV: Well-suited for import into spreadsheet applications. JSON: Great for feeding session data into custom applications. HTML: Outputs code for a web page that can be further customized or published directly to the web. Markdown: Well-suited for pasting a set of links into an online post or comment.